2,711-PAGE WONDER - The ShasPod aids in the cycle of Talmud learning, which culminates in the Siyum HaShas. WO weeks ago, about 26,000 Orthodox Jews crowded into Madison Square Garden to mark the completion of the Daf Yomi, a seven-and-a-half-year cycle of Talmud learning. Participants in the Daf Yomi - who number, worldwide, in the hundreds of thousands - study a page a day of the massive compendium of Jewish oral law, culminating in this celebration, known as the Siyum HaShas. At the door, handing out leaflets beside the Jews for Jesus and the teenage collectors for Jewish charities was an entrepreneur named Yehuda Shmidman. Mr. Shmidman was passing out glossy brochures showing a bearded, black-hatted Orthodox Jew, lighted in silhouette, wearing a pair of white ear buds. His product, the ShasPod, is a solution to a vexing question: how does a commuter study a 2,711-page book? Many commuters use audiocassettes, not just because of the Talmud's size but because of its difficulty; taped lectures generally feature a rabbi who spends half an hour explicating each page. Chaim Shulman switched to audiocassettes after finding that his Talmud was too bulky to commute with every day from Jamaica Estates, Queens, to Manhattan, where he works as a lawyer. "It's very bulky," he said. "It takes up half your briefcase." But audiocassettes are unwieldy, too; a full set of Talmud tapes usually numbers around 2,000 cassettes. "I know somebody who had his whole garage full of the cassette tapes," Mr. Shulman said. 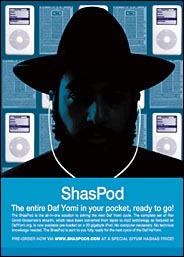 Enter the ShasPod. For $399, Mr. Shmidman sends his customers a 20-gigabyte iPod loaded with Talmud lectures given by Rabbi Dovid Grossman of Los Angeles. That is $100 above the price of an iPod alone. "We created this because of two glaring trends," Mr. Shmidman said. "One is the iPod, and the other is the Siyum HaShas, which is something so incredible that when it happens you obviously want to join the next cycle." Though he will not give exact figures, Mr. Shmidman says he has sold "about a couple hundred" ShasPods (available at shaspods.com), with a spike in sales just after the Siyum HaShas. The Chief Rabbi of Venezuela is a customer. Others are in South Africa, England and Brooklyn. Will all of these people complete the next Daf Yomi cycle? "It's like a gym," Mr. Shmidman said. "Not everybody stays at the gym; some people stop in the middle." ShasPods, like audiocassettes, are off-limits to Orthodox Jews on the Sabbath, when religious laws prohibit the operation of electrical equipment. "You can turn it on," Mr. Shmidman said, "but that's sacrilegious." He said his customers would probably use the ShasPod on Friday morning and Saturday night, thus listening to their daily Talmud lecture while avoiding the Sabbath. MP3 audio files of Daf Yomi lectures have long been available online; indeed, Rabbi Grossman's lectures are available free at dafyomi.org. But many ultra-Orthodox Jews refrain from using the Web for purposes unrelated to work, so they have no way of downloading these files. Indeed, Mr. Shmidman's only rival, Torah Communications Network, says it refuses to market through the Internet, a fact Mr. Shmidman notes with a touch of glee. Torah Communications Network's iPods, at 40 gigabytes, are twice as large as Mr. Shmidman's, but $100 more expensive. "It's a great, great price," he said. "Rabbi Grossman is a steal." ShasPod is not supported or endorsed by Apple Computer, Inc.